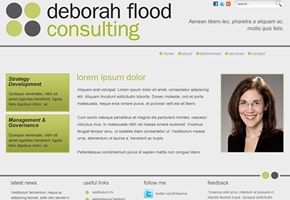 Deborah Flood Consulting help non-profit and charitable foundations to delivery great results. 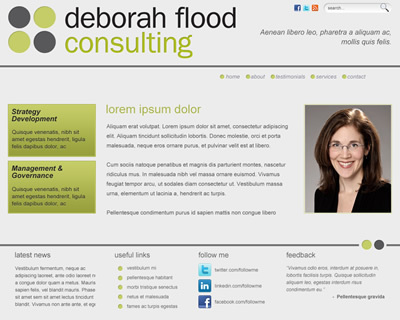 Deborah needed a site that conveyed their brand, but was also very simple to maintain and update, without additional cost. This WordPress installation includes live links to Deborah’s Twitter feed – showcasing her latest tweets right in her own web site. It also includes multiple layouts, so Deborah can change the look of a page without having to recode any of its structure. Just simply select the layout style in the administration area, save and the site is updated immediately. The site also has a spam-free contact form, which can be altered from the admin area too. Finally, the site also allows Deborah to specify page titles and meta information, which help Google and other search engines to index your site and decide how it should be shown in the search results on a page-by-page basis. very handy! Danny did a great job designing my website. He’s easy to communicate with and very helpful!